Appeared in 46 games with 10 starts…recorded 67 tackles, including 8.0 tackles for loss with 2.5 sacks, and three pass breakups. Appeared in 10 games with eight starts…AFCA Good Works Team nominee…recorded 26 tackles, including 4.0 for loss with 2.0 sacks, three pass breakups and two quarterback hurries…registered career-high 2.0 tackles for loss with 1.0 sack as part of three-tackle performance and added one quarterback hurry in hometown at No. 17 Miami…opened season with season-high four tackles, 0.5 for loss, vs. No. 20 Virginia Tech…made one solo tackle in 36-26 win vs. Samford…matched season-high tackles total with four at Syracuse…recorded three tackles, including 1.0 sack, and one pass breakup in 37-19 win vs. Northern Illinois…credited with three tackles and one quarterback hurry in 28-24 victory at Louisville…recorded three tackles and one pass breakup vs. No. 2 Clemson…had one solo tackle and one pass breakup in 22-21 victory vs. No. 22 Boston College…matched season-best tackles total with four, including 0.5 for loss, in season finale vs. No. 13 Florida. Appeared in 13 games, seeing time at both defensive tackle and nose guard while also serving as an extra blocker on goal line sets on offense and contributing on special teams…totaled 18 tackles, 2.0 for loss and 0.5 sack…showcased a breakout game to open the season against No. 1 Alabama, making five tackles, 1.0 for loss with 0.5 sack…produced at least one tackle in the team’s final nine games…won the ACC Top Six for Service award…a member of the ACC Academic Honor Roll. Played in all 13 games, including starts against USF and North Carolina…versatile defensive tackle and nose guard who also saw playing time as an extra blocker on goal line sets on offense and contributed on special teams…finished with 15 tackles, including one TFL against the Bulls…set a career high with three tackles at USF…also had three stops at Syracuse…made two tackles versus No. 23 North Carolina…had a solo tackle and a quarterback hurry in the Orange Bowl victory over No. 6 Michigan in his hometown of Miami…made the ACC Academic Honor Roll and was the Scholar Baller award winner. Redshirt freshman that broke through and played in 10 games, racking up eight tackles, including one tackle for loss at Florida…notched two tackles against Syracuse before recording a career-high three tackles in the Peach Bowl against Houston. Was an under-the-radar defensive tackle recruit in the 2014 class whose father and uncle starred on the gridiron for the Seminoles…rated a three-star prospect by 247Sports, ESPN and Scout, and a two-star recruit by Rivals…ranked the nation’s No. 81 defensive tackle by both 247Sports and Scout…helped lead Miami Central to a 13-1 record and the Class 6A state championship his senior year…had a sack in the state title game, a 52-7 victory over Seffner Armwood…captured Class 6A All-State Third Team as a senior…nabbed First Team All-State honors from FloridaHSFootball.com…All-Dade County Third Team as a junior at Monsignor Pace, where he also starred in track and field, winning the Class 2A state title in the shot put in 2012 and 2013…ranked No. 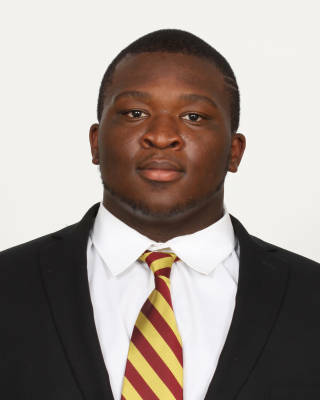 1 in state with season-best shot put mark of 61-7.50…committed to Seminoles at Jimbo Fisher Camp in 2013…father is Fred Jones, who played linebacker at Florida State from 1983-86…uncle is all-time Florida State great linebacker Marvin Jones, who nabbed consensus All-America honors in 1991-1992 and was elected to the FSU Hall of Fame in 2000…prep teammate of fellow Class of 2014 signee Dalvin Cook at Central…born August 25, 1996…majoring in social science.